Our users have asked us for better and improved for sale landing pages for their parked domains, and today we’re happy to do just that. We’ve rolled out new for sale pages that not only improve the aesthetics and functionality, but also are far more effective in closing a domain sale. We’re offering two new for sale landers. 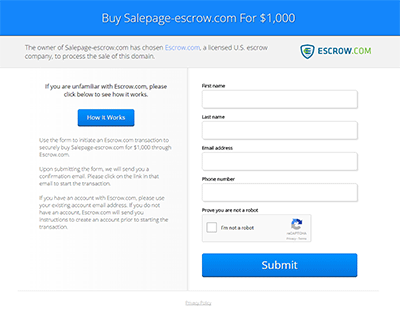 The Escrow lander allows you to set the BIN (Buy It Now) price for the domain name. It is simple yet effective at explaining the checkout process to the prospective buyer. It is integrated with Escrow.com, through which the transaction would occur. Setting your Escrow.com account details takes just a few seconds via your Bodis account settings. The inquiry lander works just like any other inquiry sale page. It allows a prospective buyer to fill out an inquiry/amount and forwards the message/offer to the seller. We have quite a few customization options on our road map for the sale pages, and we’ll be writing about them on our blog as soon as we’re closer to announcing them. In meantime, we’d love to hear your feedback! This entry was posted in Announcements and tagged domain sales, domains for sale, sale landers, sale landing pages on December 1, 2015 by Matt Wegrzyn. I noticed the upgrade yesterday and was impressed. More power to Bodis! Would recommend that in mobile version, the footer call-to-action >> “The domain example.tld is listed for sale. Click here to inquire about this domain name.” << should be moved to the top! Thank you for your feedback. I’m uncertain at this present time if your suggestion is actually feasible given the limited space for advertisement visibility. However, I’ve just forwarded your suggestion over to Bodis management for their consideration. Also, you can submit additional feedback/suggestions directly to us at any time using the “Suggest a Feature” option located at the bottom of the account overview page. Just a quick update. I was in contact with Bodis management earlier today and I have been informed that new sales link placement feature will also include mobile devices. We’re hoping to implement this new feature within the first quarter of 2016. This is a good news,no wonder the email confirmation link,refuses to be approved this is a good development,keep it up!!! I’ve just taken a look at your Bodis account and it appears as though you are now fully verified. I like the look of these pages. Great job! There is a typo on the inquiry lander. 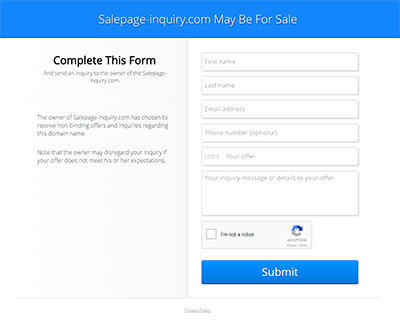 “And send an inquiry to the owner of the Salepage-inquiry.com.” should be “And send an inquiry to the owner of Salepage-inquiry.com.” Other than that, the new pages look fantastic and streamlined. Thank you for pointing that out. I’ll pass this information on to our developer shortly. why “MAY BE”? It creates doubt in the buyer mind and he might not be prompted to fill in the inquiry form. Shortly we’ll be implementing a number of advanced sale options which will include the ability to change the sale text. Once these updates have taken place, you’ll be able to manage these options on a per domain basis. If you have any further suggestions or questions, please let us know. Thank you for pointing this out. It is understandable that the present wording on our offer inquiry page could be misinterpreted by potential buyers. I’m going to notify Bodis management shortly to see if we can have your suggestion implemented. Please feel free to open support ticket if you’d like to follow up with us on this. Your for sale landing pages are blocked when someone has Ad Block Plus installed. That is not good as a lot of traffic is lost. I think you should serve this page so it is not blocked. In circumstances where an ad blocker is detected and our Tier1 ads are blocked, we serve Tier2 ads as a backup monetisation method. If neither ad feed is accessible and sale landers are already enabled, visitors should see the sale page. If you’re not seeing either Tier2 ads or a sale lander where AdBlock is in use, could you please open a support ticket so that that we can look further into this matter. how much do you gus charge for selling a domain name with the page? Once you’ve registered your Bodis account, it is free to park and list your domain names for sale through both offer inquiry and escrow. However, domain names sold via escrow are handled by Escrow.com; who charge a small commission fee of 3.25% for sales between $0.00 – $5000.00 ($10.00 minimum). If you haven’t already registered a Bodis account but would like to get started, please visit the link below.